Are you a huge fan of lobster diving? Do you spend your weekends and your vacations out in the water diving for these delicious delicacies? If you do, then why not support your sport by showing it some love. There are many people who are in love with lobster diving but then there are some that have no clue what it’s all about. So why not spark up a conversation by express yourself with some lobster apparel or lobster stickers for your gear? Below are four cools ways to show your support and get the word out about lobster diving. So what are you waiting for check them out now! A great way to show the world you love lobsters is by placing a few lobster stickers on your boat or vehicle. This will spark the interest of just about anyone who sees them. Lobster stickers are both fun and expressive at the same time! Also you can place lobster stickers on your dive tanks which will sure turn some heads. If you love lobster diving why not wear a shirt with one of these amazing creatures on it? It just might help bring up your favorite sport in a conversation with friends or even people you don’t know. Both men and women will look amazing when they wear lobster inspired rash guards. We all know the benefits of wearing a rash guard so why not wear one with your favorite crustacean on it? All your lobster loving friends will surely approve on your choose of clothing. 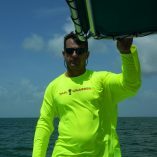 Functional and fashionable these rash guards will surely be a hit out on the open water! 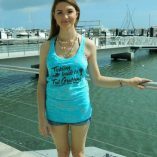 Another cool way to show your support for the sport of lobster diving is to wear a tank top with a lobster on it. Tank tops are fun to wear and they will keep you cool during those hot summer days out on the water. 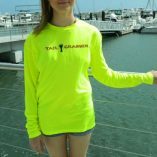 This entry was posted in Stickers and tagged apparel, Florida, florida lobster mini season, lobster apparel, lobster diving, lobster gear, lobster lovers clothes, lobster sticker, lobster stickers, lobstering.